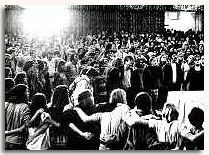 "The Jesus Movement - Singing A New Song"
The Jesus Movement took the gospel to people who wouldn't come to church, and primarily to people who wouldn't be welcome in church; dropouts, prostitutes, thieves - exactly the sort of people that Jesus went looking for. In fact, the Jesus Movement itself wasn't even welcomed in church. Many were converted pot-smokers and leftists with long hair who wore bluejeans without the compulsory necktie, or even worse, torn, tagged clothes. But like books that don't seem to match their covers, the miracle of salvation had set their souls on fire and they wanted to share it with their brothers and sisters. It started, perhaps, at Richard's Christian Halfway House for runaways, where my younger sister stayed, or perhaps on the Berkeley campus of the University of California where Hubert Lindsay preached on the "free speech steps" in front of Sproul Hall. He was hospitalized several times with ribs broken and teeth kicked in by students who beat him up, but he would always reappear, a few days later, preaching Jesus' love and forgiveness to his assailants. "Holy Hubert," with his gap-toothed smile, became a familiar visual testimony on the radical campus. The roots of the Jesus Movement stemmed from a strong desire to redeem the unlovable, the outcasts. During my high school years, as well as earlier, I began witnessing to kids, but they were awkward attempts, to be sure. Even during my band days at Capitol Records, I would witness to my "fans" who came to hear me play and on Sundays i held meetings on the lawn near the quad at San Jose State College. I lived near the campus and people were free to knock on my door any time. When I left my band in 1968 and moved to Los Angeles, I didn't feel awkward about witnessing anymore - I felt directed. I chose my ground and worked my beat. I walked up and down Hollywood Boulevard several times a day; at first alone, then with Richard Gerstle and later Sarah Finch, witnessing to businessmen and hippies, and to whomever the Spirit led me. I spent all of my Capitol Records' royalties starting a halfway house and buying clothes and food for new converts. Each Friday and Saturday I borrowed cars and drove almost 150 miles to pick up certain kids and take them to a church in a home in Santa Ana. Our meetings usually lasted five hours on Friday and eight hours on Sunday. Years later, I started a Bible study in my own home which grew into over 300 Vineyard Fellowship Churches, as has Calvary Chapel churches. This was the collective spiritual commitment of the times in which we found ourselves, and one by one, we found each other. In those early days, we had no money, no organizational skills, no community support for our work; only a desire to preach and protect, to rescue those who were lost in the haze of drugs and confusion and seemed indifferent to the traditional church. But who needed money for miracles? Jesus could and would provide all of our needs. Arthur Blessitt opened a drug-assist crash house on Sunset Strip and called it "His Place." Little by little, we all came to know each other and to offer assistance in any way we could to one another's ministries. After witnessing out on the streets for a time, I got used to hearing kids call me a "Jesus Freak." Soon I learned to accept it as a term of endearment or at least of deference, since anyone who walked the boulevard each day was soon identified by their "thing;" whether it was drug dealing, hustling, or preaching. But the Jesus Movement was such a spontaneous, silent tapestry, that only God knew He was weaving it Few of us even realized we were part of it when the press announced that it had uncovered a new bohemian youth subculture: "The Jesus Revolution". One morning while I was out on tour and asleep in a motel somewhere in the Midwest, I received a phone call from Time Magazine. I thought the call had something to do with my music on Capitol Records since the reporter mostly asked me questions about my music: When did I start writing it? Why did I write it? And did I know of any other singers who had the same message? Then he abruptly slid thanks and good-bye. I went back to sleep and didn't think anymore about the conversation. Two or three weeks later, I was surprised and excited to read something about a Jesus Revolution going on in America. I was somewhat confused and a bit disappointed to find out that it was only us they were writing about I was even skeptical, thinking it was merely an invention of the press looking for the sequel to some previous "revolution." I thought they must be scrambling for an early clue to the new direction, you know, the "what-is-our-youth-into-now?" kind of journalism chronicling beatniks, folk music, the Beatles, drugs, draft card burning, flower power, the sexual revolution, the cultural revolution, and now the Jesus revolution. It was hard to imagine that our isolated efforts might be part of something bigger that was happening in other cities across America, and that those of us who had felt the church wasn't going far enough, had simply stepped forward and gone the distance by ourselves. Jack Sparks published an underground newspaper in Berkeley called Right On! to speak to the political radicals and socially discontented. Chuck Smith set up a big tent in Costa Mesa and reached out to the unaffected middle class teens behind the "orange curtain" and Disneyland world of lower Southern California The Salt Company coffee house started up behind Hollywood Presbyterian Church and soon there were larger, free concerts at the Hollywood Palladium. The Hollywood Free Paper was handed out on street corners to tourists and runaways who were streaming into California, hoping to catch the last rays from the Summer of Love, not totally extinguished by Altamont. Historically, music has always been a part of every Christian revival. For many years, I felt rather alone as 1 sang my songs and tried to use my music for God. Year after year, church folks had told me that what I was doing was very wrong; that God and rock music did not belong together. I didn't know if they were right, but I really wasn't that concerned. I had lived in San Francisco, in a black neighborhood, where ethnic music was prominent I was trying to sing "black" music and my grandfather had a collection of old 78's that featured black artists, so this had a big influence on me as well. Mahalia Jackson, a black gospel artist, had a daily television program featuring her music which my grandfather and I liked to watch. By 1952, I had started playing the ukulele and singing some of these black gospel songs and by 1956, we had moved to a different neighborhood and I started writing my own songs. When I first heard rock 'n roll, it seemed to me that Elvis was trying to steal the music of the black church in his songs. So, I decided to steal it back. I began to perform publicly, first at school, then church, and then more widespread. Sometimes I felt like an outcast - a musical leper. I had started a band and ended up on Capitol Records and was surprised once when Paul McCartney walked up to me and started discussing my music. Knowing that people were listening to my songs made me strive even harder to get the "message" out. My attempt to get more Christian songs on my albums resulted in my getting total control over my third album, Upon This Rock, and then I was dismissed from the label after its release. For almost fifteen years I had felt like an army of one, but suddenly there was Jesus music everywhere. Many young people became Christians and began to express their faith in simple songs. Ten years before, gospel music was written by grown-ups like Ralph Carmichael and Tedd Smith and George Beverly Shea Now it was being written by kids! Ron Salsbury had come to one of my concerts and then started J.C. Power Outlet. Freddy Caban also started a band and I took Ron and Fred into the studio with me. I was happy to help almost anyone, hoping to increase the number of messengers in this musical "army." later, Randy Stonehill came down to Hollywood and began his spiritual journey. He came into the recording studio with me and I also brought him on stage as a guest artist whenever I did local concerts. I certainly didn't feel alone anymore. As the movement began to spread, religious leaders were being questioned. Hilly Graham had at first raised a cautionary voice regarding its validity. Writers had started investigating to find out if it was truly authentic. Television reporters came around wanting interviews. I didn't know if this was good or bad and I certainly knew God didn't need publicity to accomplish His work. I began to worry about the possible effect the media might have on the movement. When I was invited to appear on a television show. I invited a group named The Gentle Faith to do the interview with me so I wouldn't look like some religious rebel, walling down my own road. Though the spotlight was on me, I wanted to share the media glue, so I planned to take this group into the studio when I got back from ten days in New York. To my surprise, only Henry Cutrona was there when I returned; the other two had completely fallen away and nothing anyone said could bring them back. I was so shocked and became concerned about helping other artists record because instability was becoming 1 big problem. More and more "baby" Christians were standing up and then falling down under the sleight weight of their music. Randy StonehiII disappeared from the scene for almost four years before a newly converted Keith Green helped resurrect him. Danny Lee died from a drug overdose in a Hollywood alley after two albums on RCA. It really hurt me when the little blonde girl walking beside me on a Christian match to City Hall (on the covet of the album, Bootleg) told me she was no longer a believer when I bumped into her two years later. It wouldn't surprise me to find out now that she is involved in a Christian ministry, because such is the redemptive power of Christ The Jesus Movement was not a post-hippie fad. It was 1 real-life revival; a rollercoaster of births and deaths and rebirths. By 1972, Billy Graham had embraced and encouraged the Jesus Movement publicly and in his writings. Dr. Bill Bright's Campus Crusade for Christ sponsored "Explo '72" at the Dallas Cotton Bowl for five nights of music and crusades attracting 85,000. A Saturday concert in the open air at the raceway drew nearly 200,000. Johnny Cash, Love Song, Andrae Crouch & The Disciples, Armageddon Experience, Randy Matthews, myself, and others performed. Later, Dr. Bill Bright offered a free album of Explo '72 music. Manufactured by Creative Sound Records, over 170,000 record albums were sent to respondents to Campus Crusade's television outreach. let the arguments against Christian rock music rage on; we were focusing on higher things. The throngs seated that day would continue the rippling effect through the American culture: some as ministers, businessmen, some as mothers and fathers. The Jesus Movement was not a pastoral, pastel moment in American church history, but rather it was, and is, a life and death matter. Some feel that the purity of the movement was co-opted by the church, which did manage to get many of these young converts into nice clothes and a short haircut. Some feel that the innocence and genuineness of the music was compromised by record companies, pressuring and sanitizing the artists' music, and by the CCM charts providing a national measure for sales which disturbed the individual musical shape of each isolated community. The real Jesus Movement of course, started twenty centuries ago when Jesus' life, death, and resurrection created the opportunity for everlasting life in His presence, which is the fulcrum point of Christianity. After all that Jesus has given to us, Christianity is not about living in a nice, polite society. or at least it shouldn't be. We should not merely fellowship in our warm, safe buildings, but also go out into the cold, unsafe world, witnessing to others and affecting change in our society. For example, there are enough Christian families in America to take all of the homeless off the streets, should they be so led by God to do it and if it were a true solution to begin with. Certainly feeding the poor remains 1 logistical quandary but, nonetheless, a Biblical mandate. Meanwhile, if some think the Jesus Movement has ceased in America it has certainly spread to other countries like Africa and Russia and into other parts of the world, using ordinary men and women, boys and girls, and music. I have heard it, and in some cases seen it, having gone there to be a small part of it. God might use anyone who makes himself a servant, no matter how incomplete the vessel. Sometimes I have felt like "the chief of sinners among absolute beginners, trying to die the daily death; falling down in loneliness, rising up in peacefulness, learning from breath to breath." The Jesus Movement in America does not have to be over. I can almost feel its resurgence within; that somewhere there are young boys and girls who are angry about the complacency they see in their churches, and are offended by the slick, indifferent Christian music on their local gospel radio stations. I can even imagine their praying together that God will use them to reach their schoolmates and shake up their community. I believe that they ate practicing on their instruments and learning how to write songs which express their desire to see others come to the cross and be "reborn" to a new life. I am praying for them, for their strength and vision, and for their music to be heard.